Lisa: I’m here in Albuquerque with my cousin, David Wolfe. David, it’s nice to see you. I haven’t seen you since I met you at Eden Hot Springs and you’re looking really wonderful. I’ve been hearing bits and snippets from all over the country about how your work is so positively effecting the community. 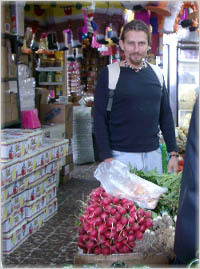 I’m running into people who are claiming a vegetarian raw foods diet is not sufficient nutritionally, that we’re operating on incorrect principles; that we’re not going to get our aminos and vital nutrients and that the mythology of our Essene Vision of Back to the Garden is simply a myth, and that there’s no evidence that a vegetarian diet is natural and normal for people. What do you say to critics like that? David, Well, I think first is whether you believe you can do something or believe you can’t; you’re right. So, it first starts with the belief that you can achieve it. The higher you rise, the greater the benefits are, the more difficult the challenges; so you see being a vegetarian is more difficult than being a meat eater, you have to be more conscious about what you’re eating. 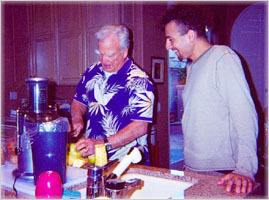 When you become a raw foods vegetarian, it’s even another level; you even have to be more conscious than you were before; you have to be more clear about your path, so to do a raw food vegetarian diet blindly, I don’t recommend. I think that’s actually a recipe for disaster. It’s like trying to lift 500 pounds on your first go, you have to work up to it, to figure it out and you have to work up to it along the way. There’s absolutely a great deal of validity to the criticism that befalls vegetarian and raw foods diets as well, so we have to look at those criticisms and say, "okay, what are those weaknesses, how do we solve them," and then move on and that’s what my work is about. Lisa: Some people trained in Chinese medicine would say that periodically there are certain nutrients that are needed in flesh foods periodically for long-term maintenance that are necessary. Do you think that’s true? David: I don’t believe that’s true. I believe all elements that appear in an animal must somewhere appear in a plant and in fact that’s been scientifically validated. There’s not one vitamin, not one mineral, not one nutrient that exists in an animal that does not exist in a plant somewhere on the planet so I don’t buy that argument. I do believe that we have to look at things critically and figure out what are the key issues: not hide them under the table, not disguise them but talk about them on the table; bring it all out, and then figure out what are the solutions and how are we going to get to the next level. Lisa: You’re part of this Essene movement. Would you like to speak about that? What that means to you? You’re an Essene minister, too, like Gabriel Cousens, Shimshai [musician]. What do you see as the vision of that community, the reason for it, and the basis for it? David: Well, I think the basic idea here is that we figure out a sustainable, spiritual, mental, emotional and physical habitat for us to live in throughout the generations; and the Essenes were a religious sect, originally a Jewish sect that actually ate a raw foods diet for thousands of years and we would be really blessed to learn from that wisdom that they gleaned through all those years and that’s why I was attracted to the Essene way of life. Lisa: For thousand of years? David: For thousands of years they’ve lived on a vegetarian and raw food diet. Lisa: I’ve never seen that. You mean even prior to the Qumran communities at the time of Yeshua, before that? David: Oh, way before that, thousands of years before that. In fact, the Essene communities were probably the original communities of Hebrews as they came out of Egypt into what is present-day Israel so that goes back at least 1400 bc. ; so we’re looking at already right there 1400 years before Jesus of that community being there. My belief is that it’s even older than that; it actually goes all the way back to the beginning of the Jewish tradition right at the very start. Lisa: Right. A lot of us have this dream of the first chapter of genesis and the myth of the garden; what if that’s just a myth? I mean, what basis? You have China that’s so much more ancient and the I Ching; is there any evidence to support that perspective that people were originally vegetarian with an incredible longevity or is that just a myth that we’re all attracted to? David: I think it’s a little bit of both actually. I think all of history is just made up. Nobody really knows what happened in the past, we just have a general idea, but the specifics are very unclear. Do I think that everybody back then was a vegetarian? Absolutely not. Just look around us today. I think most of the people were meat-eaters; some of them were vegetarians and some of them were raw-foodists, the same as it is today. There’s an old phrase that says the best way to study the past is to look at the present. So, that’s likely to be the case. There are some people who just don’t have it in their karma to be a raw foodist; they have too much doubt; they’ve got too much disbelief; they’ve got too much stuff against them and it’s just not going to happen and that’s perfect. What we’re looking at is a way of exposing ourselves as we move into the future: and this is a critical idea. Vegetarianism must become a more viable way of life moving into the future because it’s karmic-free, it’s ethical, it’s moral, it’s also sustainable, it’s also extremely low in terms of its pollution exposure within our bodies because we’re looking at a world today where we have radioactive pollution, pesticide pollution, antibiotics in the food chain, prions or mad cow disease in the food chain, and all kinds of viral diseases are increasing at epidemic proportions, fungal diseases in cancer, and so our exposure to these things are increased by eating animal food both karmically and in a physical chemical sense and that’s why vegetarianism really is kind of the way of the future; and yeah there are problems with vegetarianism and there are great problems with meat-eating, tremendous problems with meat-eating so we have to look at that also is why would somebody go this way. Well, because there are so many problems with the present diet. In fact, if we want the same thing as we’ve always had, then we need to keep doing what we’ve always done, and that really is the fundamental common-sense of what we’re doing here. If we’re going to create a new way of life on earth, we have to look at the issues, we have to look at the core dietary issues and the way that our diet affects agriculture and agriculture affects the planet; create a whole new dynamic there and then from that create a new type of world. You know, people come up to me and say, "we should be eating meat, bread, cheese." It’s like great, you want to keep doing that. Your ancestors did that. Great great-grandma did that, look where they ended up. That’s not for me. I’m not going for that. I’m going for immortality. I’m going for something way beyond. Lisa: Well, speak about that: speak about raw foods and immortality, the yoga of longevity, the possibilities. David: What we’re talking about here with raw foods nutrition is a very minimal exposure to chemicals in the environment. It’s also an extremely clean way of life so there’s very little residue in the food as it’s being processed. Your internal organs start to work properly. You get hydration occurring properly so you actually begin to reach a level of health as long as all nutrient needs are met, you start to reach a level of health that you never even knew before, not even when you were a kid. Lisa: Most people don’t even know what nutrients they really need. How would you suggest that people find out what they really need beyond just the USDA/FDA minimums? David: I suggest they come to one of my seminars because actually the information that I have in this field isn’t even in these books yet. It’s so cutting edge. Some materials that I have out there like DVDs do have some of this information, but it’s really coming into the books, where it’s an open discussion. Here’s where we want to go. Here are the challenges with the meat diet. Here’s where it’s led us, here’s why it’s led us here and then here are other choices and here are the problems that can come up with a vegetarian approach. Here are the solutions because if we’re not solution-oriented we’re not going to get anywhere. And I’m very solution-oriented: if people say this is a proper vegetarian diet, I want to know exactly how to solve that problem and then get past that. This is very important work on the planet right now. Lisa: You know I’ve been working on this and speaking about it, and then somebody threw another monkey-wrench into the imaging and said, well, you know the polar shift is coming and chances are you guys aren’t going to have your reign of peace anyway because the earth is going to flip-flop and you need to be thinking about getting off the planet. That’s pretty disappointing. I don’t know if you’ve been following the extreme polar shift controversy. David: It’s not a very fringe idea. In fact, I’m a very big student of Charles Hapgood who wrote the book Path of the Pole and that’s a very amazing geographical treatise and geomagnetic treatise on the history of the crustal movements of the earth and also the forward for that book was written by Albert Einstein, so that was not just some Joe BlowSchmo book out there. Lisa: So, you think that’s a possible future that we have to be looking at? David: It’s likely to happen. Lisa: Don’t you think raw foods vegetarianism would be a very good diet for space? David: It would be a very good idea to be thinking about these things the reason is because with raw foods your getting ten times the level of antioxidants that you get from mashed potatoes, gravy and steak. You’re getting antioxidants, you’re getting a very dense amount of nutrients when we’re talking about superfoods. We want to talk about protein let’s talk about spirulina, which is a plant food, number one source of protein on the earth. Lisa: I was reading an article that Gabriel Cousens wrote commenting on his own comments about B-12 from years ago and he was saying that there was some evidence that spirulina and things weren’t being absorbed maximally. Do you know what he’s talking about? David: I do. I think he has to take a more insured position, which is a good position to take just so nobody gets left off the deep end. I think if you are a vegan it’s a great idea to take vitamin B-12 supplement. It can’t hurt you; it can only help you. I think a lot of people get ideologically hooked up on this for whatever reason. The Essenes drank a bit of goat’s milk in their diet and that’s where they got their vitamin B-12. So that’s how they’d sustain themselves for thousands of years, but if that’s not in your ethics then you have to find another way to get it. Spirulina is a usable form of B-12 for some people but not everybody and the specifics of the science of that we don’t know yet. Or maybe somebody knows, but I don’t know of it yet. We’re going to get closer to the truth on these issues as time goes on, but the main thing is we cannot get hung up on say a vitamin B-12 supplement issue when there are 2 million chickens being slaughtered every day to feed New York City. Lisa: I know that you’re teaching at Gabriel’s school. Do you want to talk about that program or other programs (besides coming to your lectures) that are emerging people can participate in? Would you like to speak about Gabriel’s school? 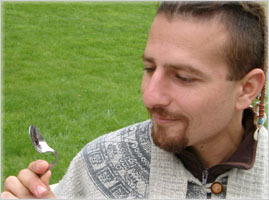 David: Actually, Gabriel Cousens has a very working knowledge of raw food nutrition. He’s just as versed or more versed than I in teaching people where the pitfalls are and how to get past them, especially vegan nutrition. The program that I do with him is the Tree of Life Master’s Course and that Master’s program is the premiere educational program in the field of nutrition in the world. There is nothing like it. Lisa: Even in Europe and what’s coming out of the spas in Europe? David: Even in Europe. Yeah, nothing’s even close. I mean, you’re going to get versed in every single form of alternative health and healing from homeopathy to traditional aryurvedic medicine to traditional and classical Chinese medicine, to traditional raw foods science, to Essene paths of light, to the latest cutting-edge in the field of raw foods nutrition and exotic nutrition to incredible levels of understanding about the role of oxygen and oxygen therapies and frequency generation machines and everything you could imagine is covered in that class. Lisa: You know my mission is a new wave of sustainable communities with sustainable businesses, gardens and schools and again I’d like to invite you to participate as it evolves. We’re having benefit concerts; they’re evolving into Spirit of the Pipe Gatherings. They were called Nomads’ Aid and I’d love to invite your band and you to participate as a raw foods counselor to be on the advisory board as these oases emerge. David: Oh, I would love to do that. It’s really a powerful thing because I do counseling for sustainable communities. I have a team of people down in Pachumomma, Costa Rica right now in the Nacoya peninsula and there’s a raw foods vegetarian community down there about 100-150 people and we’re doing the agricultural setup there; so, we’re doing that right now. I am participating in that kind of a thing. Also, we’re doing the Enota in Georgia; that’s our next project. There’s a sustainable vegetarian leaning towards raw food community there that we’re going to be doing a whole orchard setup for them. Lisa: Now are those communities coming in as egalitarian communities, as land-trusted egalitarian communities. Are they privately owned? David: The one in Costa Rica, I’m not sure exactly what the body is that owns it, but it’s a very, very beautiful setup. It’s very well done. That’s the best setup community I’ve ever been to and the people are the happiest of any community I’ve ever been to and it functions the best. I don’t know exactly what their politics are, what the mechanics are. The place in Enota, Georgia is a non-profit organization and people live and work there as volunteers and it’s just a 100 percent volunteer organization that’s all about sustainability and living off the land, bathing in the healing waters there and not having to bring in any power from the outside. Lisa: Wonderful. So, is there anything in particular that you’d like to say to people who are striving to live an alternative lifestyle and are in that grey zone right now? David: My friend Iatashia says it this way: a different level, a different devil . The higher we rise out of what everybody else is doing. And by the way, if we want what everybody else has, keep doing what everybody else is doing. I’m not one of those type of people who says we have to do something different. You want what everybody else has you keep doing what they’re doing. If you want to rise out of that and go for something different something unique something exotic something exceptional if you want to recreate yourself as a being then do so with knowledge, learn and step forward and step out as a being that’s clever, as a being that is happy, that is excited about the possibilities. I’ll tell you what, I really feel like goal-setting has been a big part of my life and I really invite anybody whose interested in sustainable communities and living together with the earth and living in a way that’s friendly to the earth let’s get into goal-setting so that we are creating goals that say hey I live in a sustainable way with the earth. I do not pollute at all. I run for example our bus on grease. Grease they say produces one quarter of the emissions and within those emissions there are certain compounds that are not even there like nitrous oxide and all these carbon monoxides and all this other terrible stuff and actually you could be running that diesel engine on grease and standing right behind that tail pipe and not even really know that it’s on. Now you know what it’s like to drive behind a diesel truck, you can’t even stand it. It’s unbelievable. That’s the difference between taking that uncertain step into the future with a little bit of knowledge, a little bit of experience and leaping and just imagining and hoping that the net will be there and the net usually does appear and the universe will support you if you step forward into the direction of your dreams. Lisa: Well, that’s good. Do you want to say a few words about the possibility of longevity with raw foods? David: I think what we’re looking at with raw foods is you can get into a place where everything is working properly, where you’re not having any digestive distress, your stomach digests things, your intestines work properly, your body is healed. There’s no crisis going on. Most people are going from one crisis to the next to the next and no wonder we can’t experience longevity. But you can get into a flow with raw foods that allows you to achieve a place of health you never even knew was possible before and what happens usually to people who get into that place is they start realizing, we could be here a lot longer than what we’ve been told. We could easily live a hundred, we could probably live a hundred and twenty, we could probably live even much longer than that. If we really got clever about things. One thing we find with raw foods nutrition, this happened with me I’ve been a raw foodist ten years, a hundred percent raw foods eater, is that your stomach shrinks. So you can’t eat very much anymore and you don’t need to and this is really powerful because the less we eat the longer we live. We know that that is the only scientifically-validated bit of information about the longevity: the less you feed an animal the longer it will live. Lisa: Now which of your books has the transitional program from cooked food to raw foods? What do you recommend people consume as literature of your books? David: Of my books I think it’s going to be the Sun Food Diet Success System or Eating for Beauty and both of them are very good books. And Eating For Beauty is kind of designed to grasp people who are in another form of consciousness and bring them into this kind of natural food and it’s like a Trojan Horse: what happens is they start eating the food and the consciousness arises and they start becoming sensitive to the whole ecological crisis and all the things that are going on and they start feeling good and they realize whoa what’s going on. Lisa: Wonderful. This is Lisa Wolf, with David Wolfe in Albuquerque and it’s wonderful to see you and I’m really looking forward to these big concerts because I want to get to jam with you, too. Lisa: And, I’d also like to invite when we do the invitational to the major artists to invite them to participate so we can finish getting all the children back to the garden that I’d love to have you be one of the talking heads and say a few words as to why we need to do this if you wouldn’t mind? David: I would love to do that. I really feel with children especially with this ADD and juvenile delinquency this is all caused by children not having their hands in the soil and once we get people planting trees and gardens ninety-five percent of our problems are solved right there. Lisa: Well, the model of the early Essene communities is still valid now and it’s a wonderful way to live. David: It’s a beautiful and simple way of life. The simpler things are the easier it is to live and the more enjoyment there is, and we live in a very complex and chaotic world but this kind of eating takes you back to simplicity and brings you back to fun and enjoyable experience of eating instead of guilt. If your gonna make a dream come true. If you’re gonna do something new. If you’re gonna create the true you. If you’re gonna become one of the few. If you're gonna take on a new task. Grab the dream and hold fast. If you’re gonna make this life last. That it's really up to you. To set the goal and finish it too. An idea on a wing. I had heard of a spiritual trip somewhere to be found. And so I began my search. I left home. I took to the highway; the great open spaces of America. I wanted to see what was out there to see. I wanted to fulfill the yearnings of my spirit. 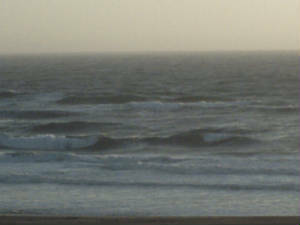 So I headed west, to the Pacific Ocean. I traveled across the great western plains, along the same pathways of the early pioneers. I was going back into time, into history, the history of this country. I was seeing it with the same sense of discovery that they may have had. If I could have, I would have been with them. But I was living in my own times, and had to do with what I had. 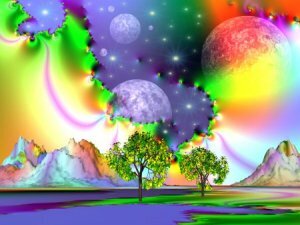 Imagination was the bridge between the past and the present. This land I was passing through was the land of the American myth, the westward expansion that was born on the day that Lewis and Clark reached the Pacific Ocean back in 1805. That was when it all started, at least for the white man. And maybe they weren’t the first. The Spaniards may have been there before. Or the Mexicans. Now this was the land of the future, the vanguard of the evolution of civilization. California was the land at the end of the rainbow, the land of milk and honey. Or so they said. Each generation has found a different story there. I had my version, too, I guess. It was a beautiful story to me because it was my life. I bled and suffered for it. I found ecstasy in it and happiness too. And I found despair in it, a dark glooming brooding that made me want to give up. And I survived it and went on to live again. I passed through the whole gamut of things. Thirty years is a long time. My journey on earth has been that of the wandering spiritual pilgrim. Even before I left the home of my father, he told me: "What is it you are searching for that you can’t find here?" I remembered him saying things like: "What do you expect to find by sitting cross-legged under a tree?" I realized that these might very well have been the same questions that the Buddha’s father might have asked him when he wanted to leave. My father belonged to a generation that had produced the kind of world I was born into in 1952. It was a world in the midst of a so-called Cold War between the superpowers, a world living on the brink of nuclear annihilation. My generation had been born under the mushroom cloud. If the soul is a visiting stranger to this earth, and desires only to be disentangled from the meshes of karmic existence, then surely the modern age offers the greatest spur towards enlightenment. Things are in such a bad state, what’s there to get attached to? On the other hand, maybe that is only a selfish motive and not very admirable. Maybe the other side of the picture is that the soul is here on earth on a mission of service, sacrifice and guidance for other sentient beings. The struggle to make one’s own destiny is an actual struggle against gravity and material reality. It is a physical battle with the limitations of time and space and the world we live in as human beings. Those are the parameters, and we slug it out in that arena. The results are there for all to see, whether we won or lost the fight. June 12, 1929-2004. Today is the 75th anniversary of Anne Frank’s birthday. The film I saw about her life, with Ben Kingsley, was excellent. It was a remake of the 1959 film, but this one followed her to the concentration camps. I am rereading Invisible Man by Ralph Ellison. I was attracted to it because it contained the dropout theme: the man who drops out of society when he realizes how illusionary it all is. In this, he’s a black man living in Harlem. I guess this book was a precursor to something like Manchild in the Promised Land by Claude Brown, which came out in 1952, also contained a riot scene towards the end of the book. It was like a prophetic look into what would later transpire in places like Detroit in the summer of 1967. There were so-called race riots there that year. The Algiers Motel Incident was what sparked it off: some black men had been harassed and killed there by the cops. All hell broke loose afterwards. And it wasn’t just there. Places like Newark, New Jersey had their own incidents of riots too. So many people were dropping out of society in those turbulent years of the Sixties. I decided I wanted to do the same thing around that time. I read as much as I could about what was happening around that theme in the country: the writers and thinkers who were talking about it. People were looking for answers and trying to figure out in which direction to go, because the normal, conventional pathways were definitely no longer working. The whole system was falling apart, and it wasn’t such a bad thing that it was. Many said it was a natural precursor to a transformation that was happening worldwide. Things were changing in a radical way and people were on the move. You were either on the bus or off of it, to coin a popular phrase of the time. Many people including many of the hippies had dropped out of society completely. That was where books like Ellison’s, even though it was talking about a black man’s experience with America, still applied to all the rest of us who were considered outcasts by the system. Four little boys, Otter and Missa move to the captivating beat of Brazilian capoera. Otter flips and spins, combining gymnastics, dance and martial arts to an upbeat Latin rhythm. 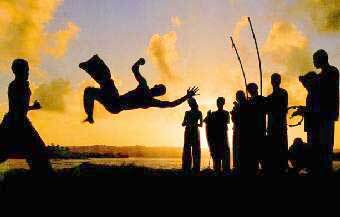 Capoeira is deceptively light-hearted for such a strenuous sport. Lisa Wolf of Vision Council got to speak with Otter, instructor of the children’s capoeira class in Albuquerque, New Mexico. Lisa: We’re here in Albuquerque at the Capoeira School with Otter and I wanted to ask Otter to say a few things about Capoeira, being an instructor, what the benefit is for the children and people involved? Otter: Hi. So, Capoeira, just a brief history of Capoeira is it’s an Afro-Brazilian martial art that has come over from Brazil and been in the states for about thirty years or so so it’s kind of definitely in its infancy. At the moment it’s going through a sort of a big growth spurt a bit like kung fu and karate in the sixties and seventies and it’s one of the only martial arts that I know that kind of fuses elements of music and dance and ritual and fight all kind of into a game. My teacher, indirectly is Mashey Accordian out of San Francisco and his school actually is in Berkeley, but he comes and he sort of supervises the teaching here, I’m kind of one of the assistant instructors here. But as far as what it means to me, teaching, it’s kind of well, capoeira becomes more than just a form of exercise, it becomes like something that pervades every aspect of your life, almost. Lisa: Well, there’s drumming involved, right? So, it’s inner attunement. 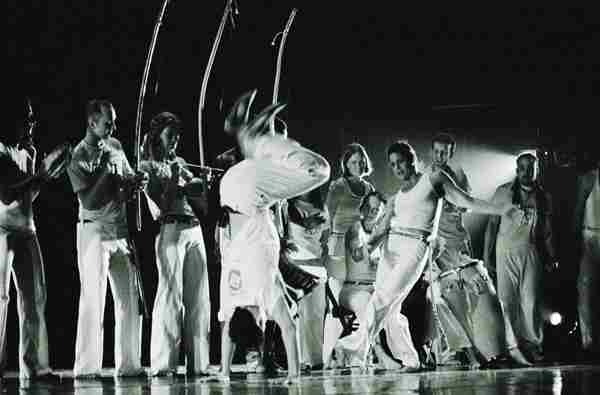 The first time I saw capoeira was in Tucson down on 4th Avenue a number of years ago. Otter: Yeah, that’s actually one of our sister schools. Lisa: Really, that was incredible and Missa was a lot younger, but we’ve been looking for a martial art, and she drums and we drum, that is actually strenuous enough to train the body and challenge the body, and it’s infectious, the music is so much fun. I saw when I came in the other day everybody standing in a circle and everybody’s just there together. Otter: Yeah, well, that’s one of the things that is really stressed and the "haade" (it means wheel) is the circle that two players play inside of and whether you’re just standing on the outside, you’re always a participant because you’re clapping along with the music, you’re singing , the songs are all kind of call and response where one person sings the verse and then everybody sings the chorus and they’re all in Portuguese, so there’s some as you get more into capoeira you end up learning more Portuguese language and what the songs mean and stuff and a lot of them are rooted in slavery and basically it’s one of the only black martial arts that I know of, I know there’s a couple out of Africa, but it’s like a lot of the songs are the songs of the oppressed. Lisa: And so when you perform, when the adult troupe performs do you also perform the music live? Otter: Yes, we always do. The orchestra of capoeira is called the battarilla and it consists of three bitenbaus, one or two attabaquis which are the drums, congo drums kind of, and then usually two panderos, which are the tambourines and an agogo which is kind of a bell-shaped instrument and then that’s usually it, sometimes there are a couple of other instruments in there, but, when we’re performing in between the games that are going on inside the haade people switch out whose playing instruments throughout. One of our little rules is that you’re never supposed to switch instruments while two people are playing because that can kind of break the flow of the music but in between each game of two individuals then we’ll switch off whose playing instruments and stuff. We really encourage all the students who are studying here to learn Portuguese and to learn different songs so that it’s not just one or two people who are singing all the songs, but so everybody can participate. Lisa: So, how do you help that process along, that learning process? Otter: Well, a lot of times our classes are like three hours long so we end up, it’s pretty hard to just do physical movements for an entire three hours, so we spend some of that time just practicing music. Lisa: So you spend time drumming with them? Otter: Yeah. With the bitenbaus and sometimes we’ll all play instruments and sometimes some of us will play instruments and we’ll focus on learning different songs and breaking them down so you can understand the words and get an idea of what they mean. Lisa: How long has the school been here in Albuquerque? Otter: Actually in this particular space it’s been here about three years but there’s been capoeira in Albuquerque much longer than that. One of Master Corgeon’s first students moved to Santa Fe from the Bay Area and started teaching there about twenty years ago and it’s been kind of going on and off since then. When I first started we were training down at the Harwood Art Center closer to downtown but it’s been in a lot of different places. We’re very lucky to have our own academy here. Our previous teacher Maluco and he rented this space and got it going and he had the philosophy of build it and they will come. At that time the capoeira school was very small there were only about seven or eight dedicated students and now we have more like twenty or twenty-five and we’re able to pay the rent, and keep it going. We’ve also thought about grants and different things like that to keep it going, but actually we’re doing okay. Lisa: There’s Tuesday and Saturday children’s class? Otter: There’s Tuesday and Saturday children’s class and there’s adult class Monday, Wednesday and Saturday and then Friday’s like a class that goes from 6 until 9 and it’s more just the haade and playing games and that kind of thing. There’s some learning then but it’s less an official class structure. Lisa: So, it’s quite actually a community. I would think that originally the capoeira must have grown out of living communities in South America and does that start to happen in the capoeira community? Otter: Definitely it’s a pretty-tight knit group here. Capoeira is like a really mixed bag because in some ways people trace it all the way back to the runaway slave villages where Brazil was just this huge undeveloped country, it still is, and when the slaves would just run away into the jungle and they could hide out in there because it was so big and so they formed these communities out in the jungle. Lisa: Which is probably where the music came into it. Otter: Yes, it’s interesting that the drum and the bidenbau, there was no real music. The bidenbau came into capoeira more in the last 100 years or so, but even the drums they’re not sure when the drums became a part of it because drums were not allowed for a long time. Lisa: Because of the sound? Otter: Because of the sound and because Africans could kind of communicate with each other using drums and it made their slave owners nervous. Lisa: Right and they could be heard. Otter: But when capoeira really flourished was in the inner cities when it was kind of a way like black self expression. Lisa: So it grew up in tandem with rasta? Otter: Possibly, I’m not sure about that because it was even more in the Southern hemisphere and even older than that. Lisa: So it incorporates indigenous South American forms then, too? Otter: There are definitely some aspects of it are not purely African. 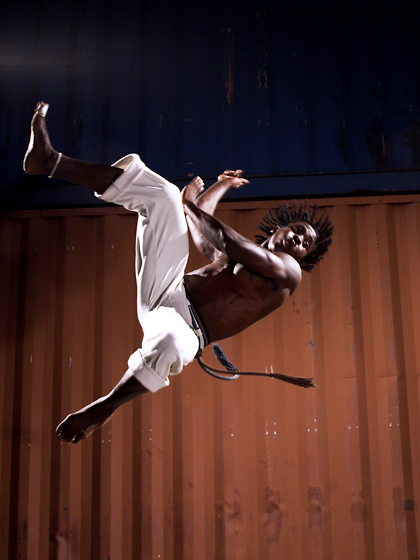 There’s nothing quite like capoeira that comes straight from Africa. What it seems to be is capoeira came out of the mixing of lots of different African tribes when slave owners would mix up their tribes so that they wouldn’t be able to form any kind of union and fight any kind of rebellion. So, it’s like all these different African cultures kind of thrown together in this kind of melting pot, a bit like how different black art forms have appeared in the states just different tribal cultures being thrown together and there’s definitely some uniquely Brazilian aspects. Lisa: So, how did you come to capoeira? Otter: I actually got into capoeira through my sister who does capoeira in England and just so happened that I was living very close to where we used to train at the time. I have three kids, so I started after all three of them were born and all three of them do capoeira now. For me it was a time in my life when I needed something solid that I was kind of unhealthy at the time and working hard. Lisa: So, you weren’t able to walk down the floor on your hands and backwards? Otter: No, no. I’m actually one of the oldest people in the school. 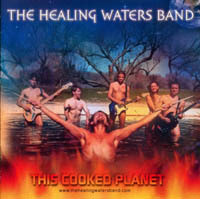 The Healing Waters Band is an up-and-coming all-raw rock and roll group from San Diego, California. Over 20 original songs have been written and the first compact disc is entitled: This Cooked Planet. Drawing upon inspiration of The Beatles, Elvis, Pink Floyd, Led Zeppelin, The Doors, Van Morrison, Credence Clearwater Revival, Van Halen, The Cars, Tom Petty, Old Queensryche, Old Metallica, and many one-hit wonders, the Healing Waters Band has synthesized a completely unique sound that is sure to take this music to the top. The high energy and emotionally-intense guitar-wizardry of David Steinberg is guaranteed to awe you. 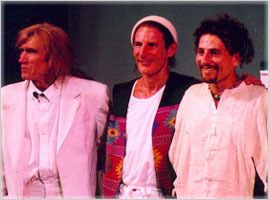 The flailing arms and progressive percussion of David Wolfe is sure to move you. When you get it "to-go"
When you’re done with your burgers and fries? With the boxes from your hot apple pies. Some softdrinks and soup and some beer. As a big problem for all of us here. The tons upon tons of our waste. In how much stuff we all throw away. We would consider beyond just today. And we’ll still get it "to-go"
Requires lifestyles conducive to pace. New Mexico School of Natural Therapeutics, Albuquerque, Interview with Alison Owens. Lisa: We like to promote sustainable businesses that teach people how to maximally heal their bodies. Would you like to talk about the school, how this place happens to be here in Albuquerque? Alison: The school was founded 30 years ago; actually, we’re one of the oldest massage schools in the United States and we were originally part of a school in Santa Fe that branched off and came down to Albuquerque. Our present director, Robert Stevens, took over as director in 1977 and Robert had been trained extensively in the philosophy of natural cure, and a lot of the practices of natural cure such as strict vegetarian diet and colon therapy, hydrotherapy, various types of water therapy. So, Robert’s vision for the school is to always work within the laws of nature and I think that’s part of why we’ve been so successful for so long, and we’re very different. There are so many massage schools now. When we started we were one of the only massage schools in the United States; now there are 100’s, probably 1,000s, but none teach the philosophy of natural therapeutics which is the cornerstone of our educational process and our graduates always get back to us that we emphasize energy work, polarity therapy, cranial sacral therapy and now, of course, we teach a whole spectrum of modalities that facilitate the healing process such as homeopathy, living foods nutrition, Bach Flower Remedies. Lisa: What about mineral waters such as colloidal silver? Alison: Robert talks about these and we sell those products in our store. I wouldn’t say that’s a big part of the educational process as we do mention and sell in our store. Lisa: What would you say sets the school apart? Alison: Several things: our emphasis on energy work, not just massage, but on energy work; our focus on a non-allopathic medical model of healing which is natural therapeutics and our focus on nature cure so that the whole specturm of modalities that go along with body work. Lisa: How long is the program? Alison: 800 hours of training and there are 3 ways you can take it: either full-time during the day for 6 months, 9-5, Monday through Friday, and that’s offered twice a year, and then once a year we offer a part-time evenings and weekend program that meets 3 nights a week and every other Saturday all day for one year. This fall we’ll start our first morning program that’ll meet from 8:30 to 12 Mondays through Fridays for 1 year. Lisa: What is the vision for the future of the school? Alison: Well, we want to keep attracting people. We always find people who say, "oh, my gosh, this is just what I was looking for. I haven’t been able to find a school that teaches these modalities and has this orientation. A lot of schools are popping up that just want to teach anatomy and physiology and massage and they’re more geared to a medical model and that’s not our model. Our model is nature. We do everything based on nature’s laws. So, we’re constantly finding people who want what we offer so our goal is to get the word out and keep drawing people from all over the world. We have visions of a healing retreat center. Lisa: Is there any residential community that’s evolved around the school yet, or do you envision that? Alison: We’ve thought about that, yes, we’ve given it a lot of thought. Lisa: Do you see yourself moving in that direction? Alison: Yes, but you see we’ve just expanded in the last few years tremendously. We bought this building 7 years ago and then 2 years ago, we bought the apartment building next door and turned them into our store and clinic. So, we have a pretty large overhead right now and we’re trying to get regrouped into this state of expansion before we do anything else. Lisa: Wonderful, is there anything else you’d like to say? Alison: We have nationally-known instructors who’ve been in the body-work field for 30 years. We have really good teachers. Lisa: What if someone’s interested? Alison: We encourage people to come down for a tour of the facility, talk to Ellen Applebaum, our admission’s advisor and we have a one page application form. We have financial aid loans through Key Bank. They loan for living expenses while in school. We try to make the program accessible. It’s a lot of work to get through the program so people have to have some discipline. Lisa: Are people finding when they get through the program are they able to get licensed? Alison: Our students have a very high pass rate on the national certification exam which is necessary to get licensed in New Mexico and we get very positive responses from our graduates all around the country. Lisa: You haven’t reached a saturation in New Mexico? Alison: Well, Albuquerque and Santa Fe are pretty full of massage therapists. Lisa: But your graduates are more than that: they’re a natural therapeutics practitioner. Alison: Exactly, they have a lot of tricks in their bag that massage therapists don’t. The Crescent Valley Goldies’ Bazaar at the Crescent Valley Senior Center Saturday, October 22nd was marked by unusual participants this year: a belly dancer, aura photographer and card reader as well as a number of vendors. Card reader, Laura Leader of Elko, known as “Leader the Reader” had a line of people waiting for her services. 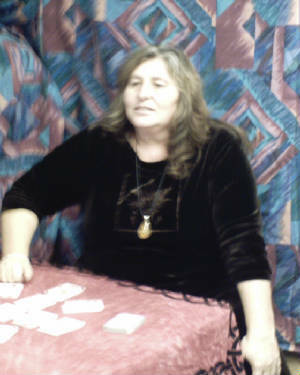 Leader began reading cards professionally in December of 1984 and reads using a simple deck of playing cards. When tarot cards were banned in Italy in the middle ages, “the regular deck of playing cards were adopted” and “they called it playing cards so they could still do readings and look like they were just playing cards,” said Leader. Leader’s website, cardsbylaura.com brings clients from around the United States. For Halloween Leader will read at the Red Lion beginning at 7 p.m. on October 29th for $5 a session. Myers also makes house calls. People come for readings because they want to know what’s coming up, said Leader who told of a reading she’ll never forget. “This woman hadn’t seen her children in 12 years and it showed up that she would get a collect call from her daughter and that her daughter would come and live with her and two days later she got a collect call from her daughter she hadn’t talked to in 12 years and she did come to live with her” in Elko. In addition to belly-dancing Myers practices fire dancing, the Polynesian art of ‘poi.’ She and other fire-dancers gather at Myers’ house. Interested people should e-mail Myer at electricfairywing@yahoo.com and can share other forms including poetry and songs. Participants have tea and then perform for one another with no dues or fees. Due to interest raised at the Bazaar, Myers will begin teaching a belly dancing and poi class for children and adults in Crescent Valley beginning next weekend at 8 p.m. the Ranch House. Judith Benton amazed Crescent Valley residents with her aura photography. Benton of Rainbow Images Aura Photos and Gifts first became interested in aura photos 10 years ago and when the money became available bought an aura camera and did her first show at the Elko Convention Center. Benton photographed 500 people’s auric energy fields that day. Benton opened Rainbow Images in Elko at 528 Commercial Street in December of 2004. As well as providing aura photos the shop carries self-help books, crystals, rocks, prayer books, and angel things.